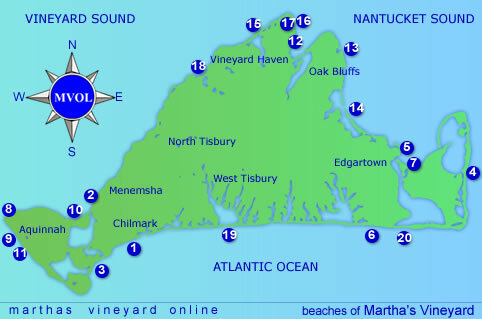 The unspoiled charm of Martha’s Vineyard is probably best exemplified by the many scenic beaches located here. The beaches vary from protected, shallow, clear-water stretches on the northern and eastern sides of the Island to expanses of rumbling surf along the south side. 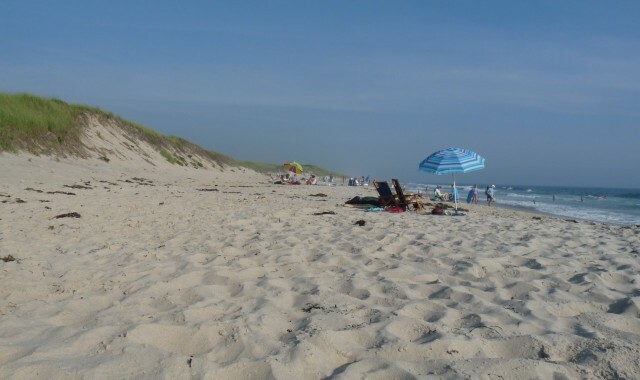 Some beaches are open to the public without restriction, while others are reserved for residents and summer visitors staying in the towns where the beaches are located. To visit these beaches, a parking and/or beach permit is required. Permits can be obtained by contacting the town hall of each community. 8. Gay Head Cliffs and Beach: Off-limits. The Gay Head Cliffs are a National Landmark and are seriously endangered by climbing on the cliffs and removal of clay (both prohibited by law). 9. Gay Head Public Beach (Moshup Beach): Surf beach off Moshup Trail. Extends from Philbin Beach to just before the cliffs. The beach is approximately a ten-minute walk from the parking lot on a cleared trail. There is a $15 parking fee in summer. 10. 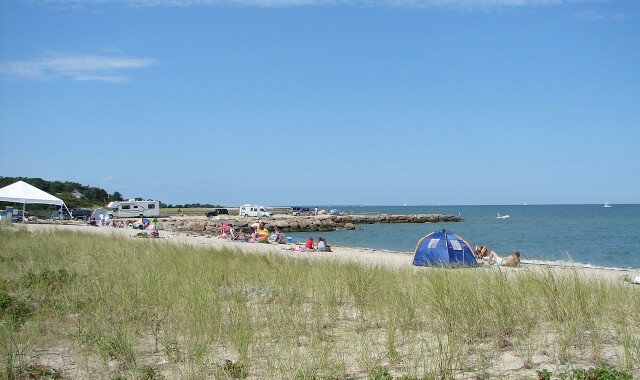 Lobsterville Beach: Two miles of beautiful Vineyard Sound beach and dune land along Lobsterville Road. Includes a seagull nesting area, and is a favorite fishing spot.Open to all, but parking is prohibited on Lobsterville Road. 11. Philbin Beach: Surf beach off Moshup Trail. Gay Head residents only. 1. 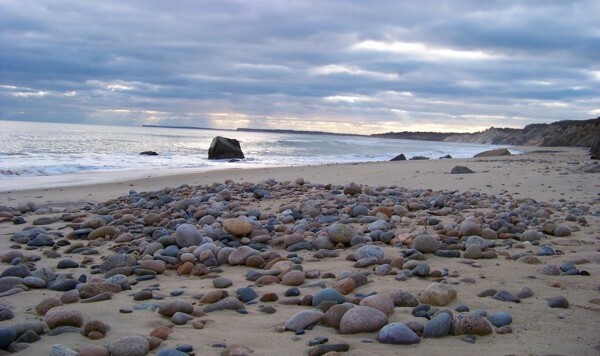 Lucy Vincent Beach: Chilmark section of South Shore. Surf, bluffs. Chilmark residents only. 2. Menemsha Public Beach: Next to Menemsha Harbor. A gentle beach with the clear, bright water that is typical of the North Shore. Open to all. 3. 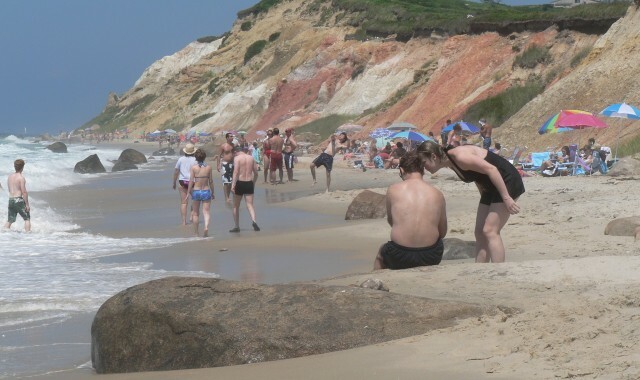 Squibnocket Beach: Chilmark section of South Shore. A surf beach. Chilmark residents only. 4. 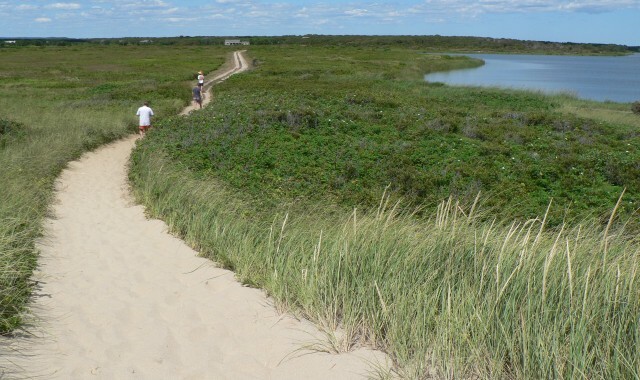 East Beach (Cape Pogue Wildlife Refuge and Wasque Reservation): Located on Chappaquiddick Island. One of our best. Open to all; however, subject to regulations of The Trustees of Reservations. 5. Fuller Street Beach: At the end of Fuller St. near Lighthouse Beach. Open to all. salt-pond on the other. Open to all. Vehicles with permits allowed on marked trails. 7. Lighthouse Beach: A harbor beach at Star-buck’s Neck, off North Water St. Walking distance from center of Edgartown. Open to all. 20. 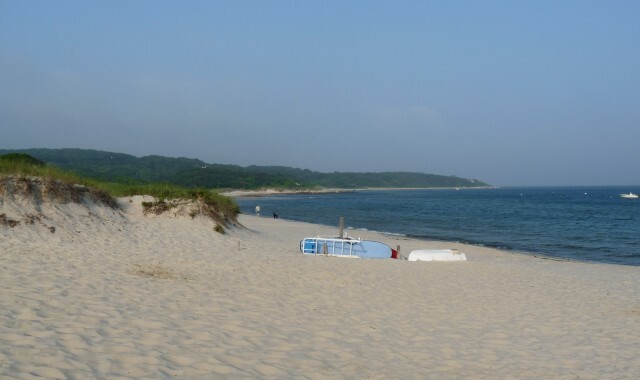 Norton Point Beach: Prior to a breach that occured a few winter’s back, this beach connected Left Fork Beach with Wasque and Chappaquiddick. Norton Point Beach is the only island beach permitting oversand driving. Get your oversand permits here. 12. 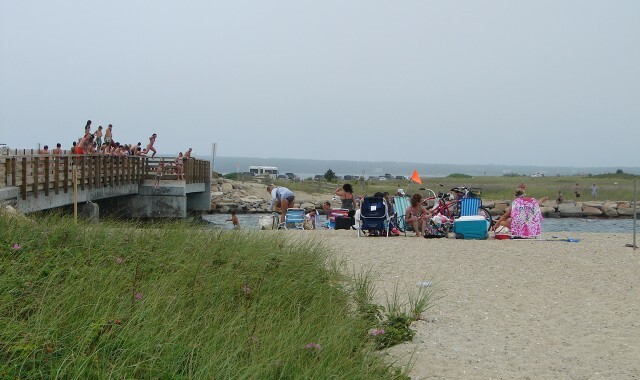 Eastville Beach: At the bridge between Oak Bluffs and Vineyard Haven.Open to all. 13. 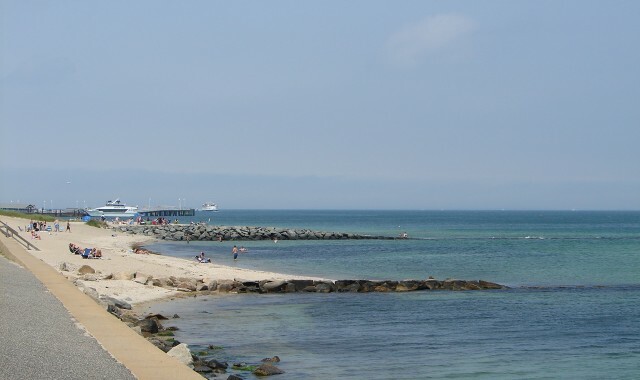 Oak Bluffs Town Beach: Calm, shallow water. The beach begins near the Steamship Authority dock. 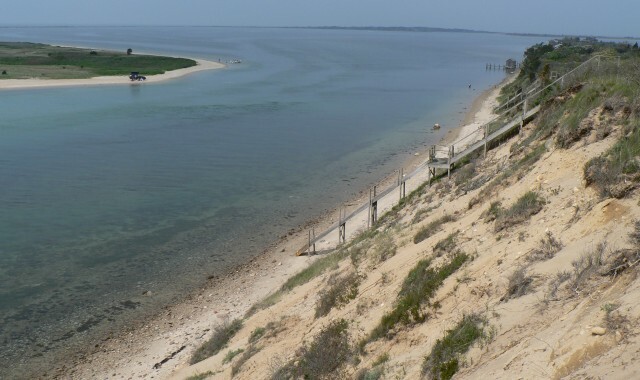 It terminates at the first jetty heading towards Edgartown, located at the end of the breakwater and marked by a fence. 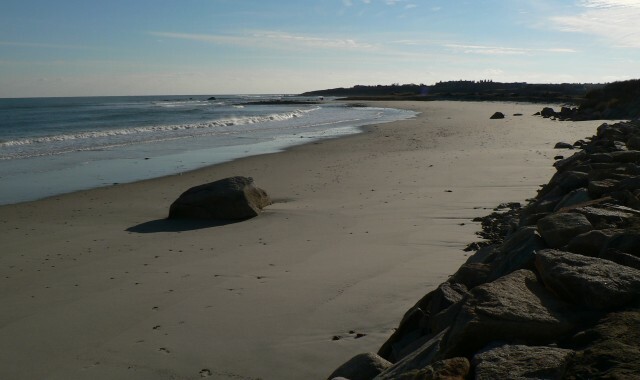 The beach continues again about one mile southeast of the small inlet flowing into Sengekontacket Pond, and ends at the state beach (next listing). Open to all. 14. 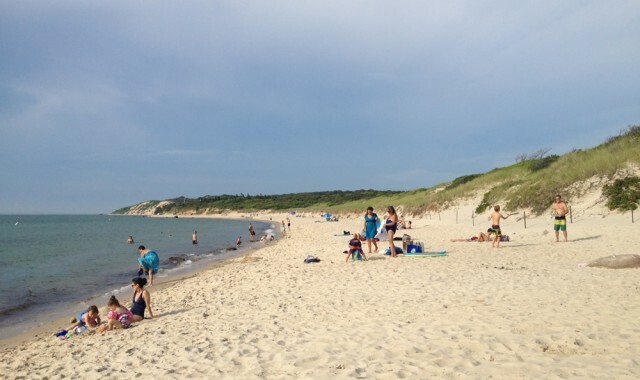 Joseph Sylvia State Beach: Two miles of clear, mild beach along Beach Road between Oak Bluffs and Edgartown. (The section in Edgartown is called Bend-in-the-Road Beach.) Accessible by bicycle path. Open to all. 15. Lake Tashmoo Town Beach: At Herring Creek on Lake Tashmoo. Open to all. 16. Owen Park Beach: A harbor beach off Main St., near the center of town. Open to all. 17. 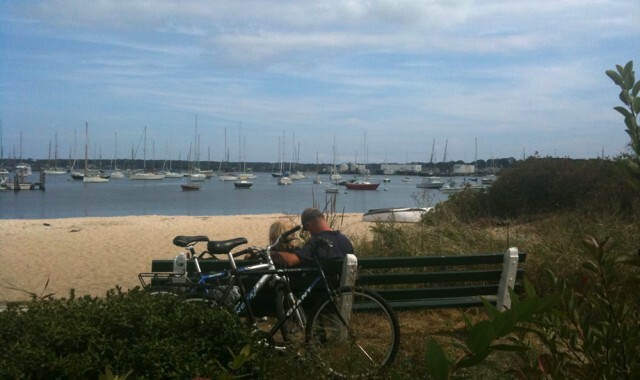 Tisbury Town Beach: End of Owen Little Way, next to the Vineyard Haven Yacht Club. Open to all. 18. Lambert’s Cove Beach: Considered by many to have the finest sand and clearest water on the North Shore. West Tisbury residents only. 19. Long Point Wildlife Refuge beach: Located on the South Shore. Open to all; however, subject to regulations of The Trustees of Reservations.